Planning is a social endeavor. Public hearings, outreach meetings, charrettes, surveys, and comprehensive plans all seek to engage with and communicate the shared vision of the largest number of stakeholders as possible. Planning is collaborative. One government agency or one team of consultant experts alone cannot possibly determine the best course of development for a neighborhood. Rather, the interdisciplinary approach yields the best results. But who is going to organize the charrettes? Who is going to manage that large interagency project or design the maps needed for a public hearing? There is a place for the individual in the planning community, and the Maryland Department of Planning (Planning) strives to nurture those interested in establishing and advancing their careers in the field. Planning, in partnership with the Department of Natural Resources (DNR) and Salisbury University (SU), developed a creative method to preserve a vital planning program while simultaneously advancing educational opportunities for Maryland students. In 2008, DNR’s Critical Area Circuit Rider Program ended. DNR’s Critical Area Program protects the Chesapeake Bay by monitoring and guiding development, conserving natural resources, and allocating population growth near the Bay. Smaller municipalities relied on these Circuit Riders, Planning staff members who traveled from town to town and administered local Critical Area programs. Municipalities on the Eastern Shore, which have a significant amount of Critical Area, were hit particularly hard by the loss of the program. In response, Lower Eastern Shore Planning staff, DNR, and SU developed the Critical Area Circuit Rider Internship, demonstrating the positive outcomes arising out of collaborations between government and institutions of higher learning. Each organization plays an important role in the program. DNR provides funding for an hourly wage, SU selects and supports each intern, and Planning provides working space and training for the student while also managing the work. The selected SU student signs on for a two-semester internship (8-10 hrs per week). She or he starts by learning the history of the Critical Area Program and the logistical/legal requirements of its implementation. 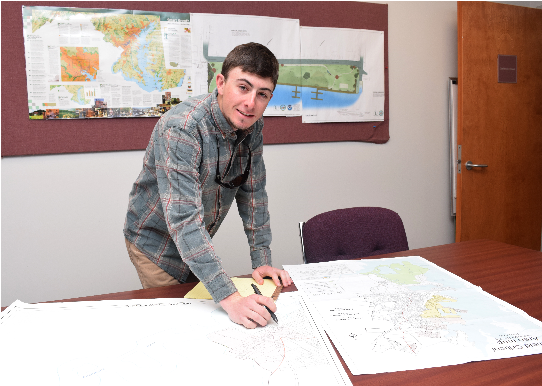 A few months in, the intern will begin taking on some Critical Area projects for local municipalities. Finally, Planning will design a large capstone project through which the student can both address a local planning issue (not necessarily related to the Critical Area Program) and build a resume’. All parties benefit, the organizations and community of course, but also the student. Salisbury/Local Investment Project: Interactive map depicting all recent and ongoing planning projects which received state and local investments. Salisbury is also using the final product as a map framework, which can be populated with new information and is accessible to the public and local officials. Town of East New Market Historic District Commission Guidelines: Research and recommendations on establishing architectural design guidelines for the Town of East New Market’s historic district, which the Town adopted in 2015. Lower Eastern Shore Priority Funding Area (PFA) Certifications: Analysis of whether Planning’s PFA Comment Areas could become PFAs (eligible for state funds). The intern worked with local jurisdictions to develop draft local letters requesting state concurrence with PFA designations and assisted the Lower Eastern Shore office in preparing Planning’s response letters. Climate Adaptation Analysis for the Lower Eastern Shore Region: Analysis of Worcester County’s Comprehensive and Hazard Mitigation Plans contributing to a statewide review and compilation of climate adaptation to be presented to the State Climate Adaptation Workgroup. Hunter Phillips, the intern who completed the climate adaptation analysis, acquainted himself so well with the program that DNR decided it could not lose him. The department took him on as their own summer 2017 intern to continue work in the Critical Area Program. Hunter is currently reviewing subdivision plats and variance requests for the Critical Area Commission, while also conducting fieldwork to help locate the Critical Area boundary in multiple jurisdictions. Planning embraces the opportunity to train the next generation of Maryland’s professional planners, and one of the most effective ways to do that is through collaboration with Maryland’s colleges and universities. What started as a stop gap measure to fill a need in the Critical Area Program has matured into a workforce and community development initiative essential to the sustainable growth of not only the Lower Eastern Shore community, but also its leaders. To learn more about the Critical Area Circuit Rider Internship, please contact Tracey Gordy at tracey.gordy@maryland.gov or 410-713-3460.